The following, below, is a post I made to Facebook on November 12th, 2018, after having heard the very sad news that Stan Lee, (born Stanley Martin Lieber), had passed away. There was a photo of Stan Lee, from 1968), from my Stan Lee eulogy Facebook post, which I include here, also. The rest of this article, below that, is brand new, not posted, till now. Marvel Comics’ creative giant Stan Lee has died. I only found out that Stan Lee had passed away, at the age of ninety-five, while I was at work, on the late evening of Monday, November the 12th, 2018, as I hadn’t had time to turn on my home PC, prior to leaving for work, for a long shift. I had looked at my watch, to note the time I found out about it, admittedly late in the day. In fact, I only found out about this at 8:08 PM, Atlantic time, on November the 12th. A mid-fifties looking, gent, had come into my workplace, wearing an Amazing Spider-Man tee shirt, under his zippered down jacket. I asked him if he was a comics fan. He said, “A little bit.” Which may indeed have meant that he was only a little bit into comics, (or) that he may have felt a little embarrassed, disclosing this interest to a complete stranger, myself. He was about my age, not a kid. I told him, “I don’t know if this will interest you or not, but I own an original Amazing Spider-Man # 1, from 1963.” He asked me what grade it was in; I told him. That’s when he informed me that Stan Lee had passed away. I said, “Are you joking? !” I really thought he was. I mean, he had to be. He assured me he was not joking. A colleague then said to me the colour had drained out of my face. We keep losing these amazing people, every year. 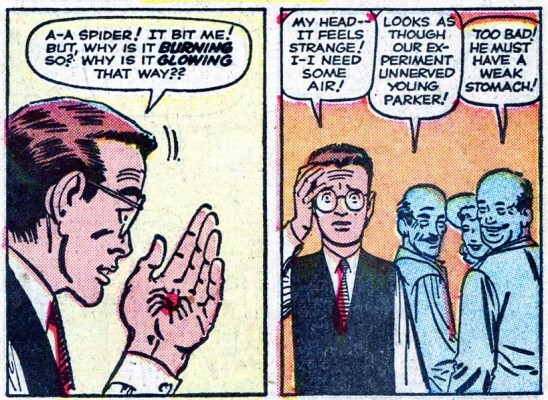 We just lost Steve Ditko, so very recently, Spider-Man’s OTHER father. Literary Legends eventually die, just like the rest of us, very regrettably. This one hit me just as hard as when Pierre Burton died. Stan Lee, the man who, for roughly sixty plus years, gave new meaning to the word, “Excelsior!” ~ is no more. To me, they’re just like cats; they really get into your heart. The photo attached is from 1968. I grew up in the 1960s and 1970s, having been born in May of 1960. I have a brother, James, who is eight years older than I. He got the comics buying, reading and collecting bug, therefore, before even I did. He probably feels otherwise about my comics collecting hobby, which has lasted to this day; however, comics have felt, (to me), like a life-long gift. No matter how bad things can get in life for any one of us, (and I’ve been there, a handful of times), the escapism of comics got me through it. And yes, I know the difference between fiction and reality. My brother James and I were both there, for The Silver Age (the 1960s) Of Comics; and we were both even bigger fans of Marvel Comics from those years, more so than any of the other comics publishers of that time. This was despite the fact that both of us (back when he was still buying them), were buying and reading comics from numerous other publishers, as well! This particular title, ‘Not Brand Echh!’, was undoubtedly an experiment, because there was nothing else like it on the stands at that time, aside from MAD and MAD imitators. Surprisingly, in those times, however, Not Brand Echh, from Marvel, lasted a full thirteen issues, with ‘Mirthful Marie Severin’ at the art helm. This series was a satiric ‘thumbing one’s nose’ at the dastardly competition, DC Comics, home of Superman, Batman, Wonder Woman, The Justice League of America, Green Lantern, and so on. Oh, and the Super dog, Krypto, and Streaky, the Super Cat, not to mention (but I will), Beppo, The Super Monkey, Comet, The Super Horse, and all the other stupid super animals that hung out, over at DC/- National Comics. No, Marvel Comics’ ‘Not Brand Echh!’ title poked fun at Marvel’s own heroes, as well! The ‘DC’ emblazoned on the main competition company’s covers actually stood for ‘Detective Comics’, one of that company’s oldest still-running titles, at Marvel’s, ehh, ‘Distinguished Competition.’ See what I did, there? My family, including my parents, Ed and Sheila, and their children, from oldest to youngest, being James, Gail, Janet, myself, Carol, Susan and my late youngest brother Chris, lived, throughout the sixties through about half of 1970, in a rented house in the tiny fishing hamlet (too small to call it a town) community of Herring Cove, right on the Atlantic Ocean. I’m telling you, the reader, this, for a reason. But, we’ll get to that. Also, I should point out that the intention of this article is hardly intended to be the end all and be all, of the life and career of Stan Lee. Far from it. No, in fact, I thought it would be much more fun for me to talk about my memories of having grown up as a child, then as a teen, and the following decades beyond that, as a life-long fan and collector, of being a Marvel Comics fan, and collector. My own grade school that I attended, meantime, was right in the hamlet of Herring Cove, where we lived. We got a half hour break, at mid-day. Since the school was very close to our house, I’d go home mid-day, and get into all of his comics, daily, and read one or two, before I dashed off to school, again. And, he always never, ever seemed to be any the wiser, for it, thankfully! Within a few years, I was buying my own comics. I inherited many of his, when he became disinterested in the hobby; when he became much more interested in reading dad’s daily newspapers, instead. To no one’s surprise, both him and our younger sister, Carol, eventually became newspaper journalists! I was awe-struck by Stan Lee’s Silver Age comics group mail order club, “The M.M.M.S”, in the early to mid 1960’s, which stood for ‘The Merry Marvel Marching Society’, in which you could order through the mail, from ads in 1960’s Marvel Comics, pins and buttons, stickers, posters, stationery, tee shirts, and so on, items that were ONLY available by ordering them, through the mail, and all of them emblazoned with Marvel characters, all over them! I was probably the very first kid in my area, in 1966, however, who got his very own complete set of the very first Marvel ‘action’ figures ever made! These were not true action figures, of course. 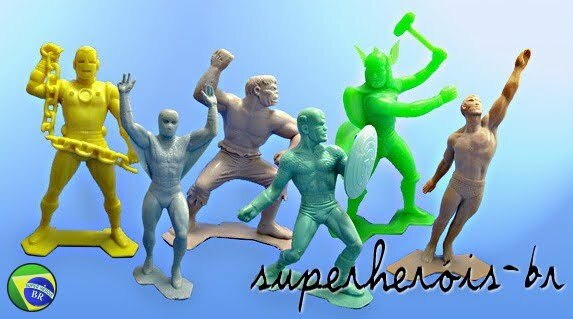 They were, instead, plastic statues, about five inches tall, each, of the following: The Amazing Spider-Man, Daredevil, Captain America, The Mighty Thor, The Incredible Hulk, and The Invincible Iron Man! We didn’t have to order them through the mail, though, as did most people, in the mid-1960s. My late father actually bought them for me, for a birthday present, when I was about six years old. He bought them, all in one transparent plastic bag, at a Canadian department store called Eaton’s, in Halifax, Nova Scotia, about seven miles from our rented house by the Atlantic Ocean. The six first-ever Marvel character figure toys, listed above, cost him all of one single Canadian dollar, for the entire set of six! The point is, not-in-the general knowledge of comics historians, were that these very first of any type of Marvel figures/-toys, were available, as well, though at least one store chain, EATON’s! Many years later, I would learn that, In the United States, south of the Canadian border, these same first-ever Marvel Comics figures were made and molded, (in the U.S.), in rather garish ‘Day-Glo’ colours, that, further, made it difficult to see the sheer detail, in the design of these exquisite Marvel toy figures. 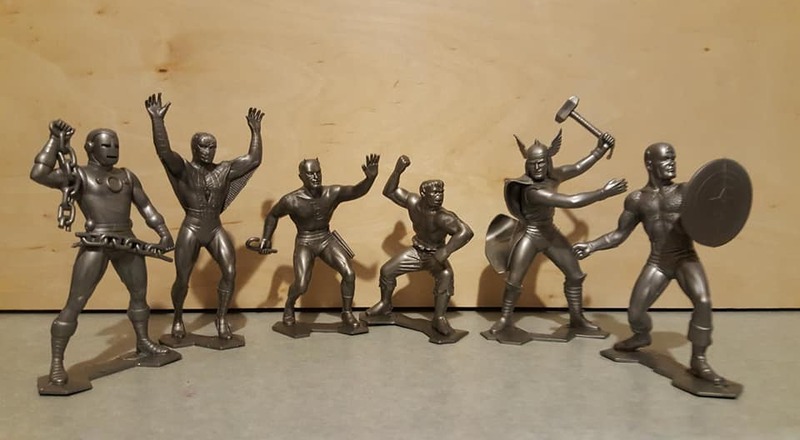 In Canada, however, meantime, these same six 1965 or 1966 first-ever Marvel Comics character figures were molded in a silver/-gray type of colour, which made the intricate design of these now vintage toys, really stand out! 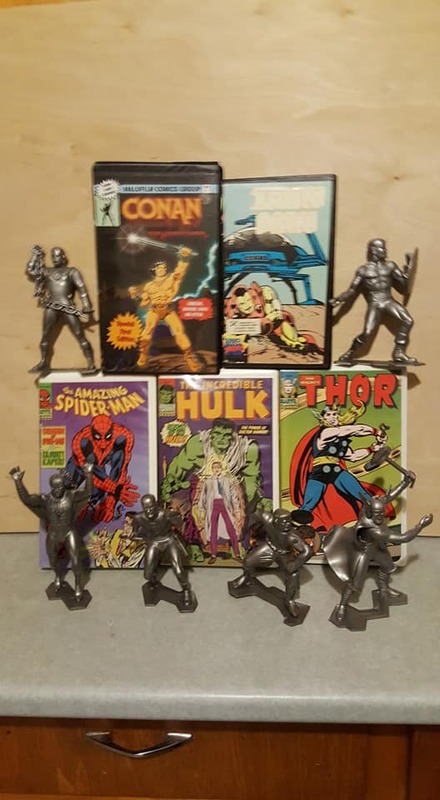 And further, the other reason I liked and still like the Canadian silver/-gray colours of the Canadian releases of these vintage figures, much better than the ‘dayglo’ colours of the American counterpart same figures, was that the Canuck silver/-gray versions really reminded me of the very large, silver/-gray large statues of The Avengers themselves, on the front lawn of Avengers mansion, in very early issues of the 1960’s comics series The Avengers! 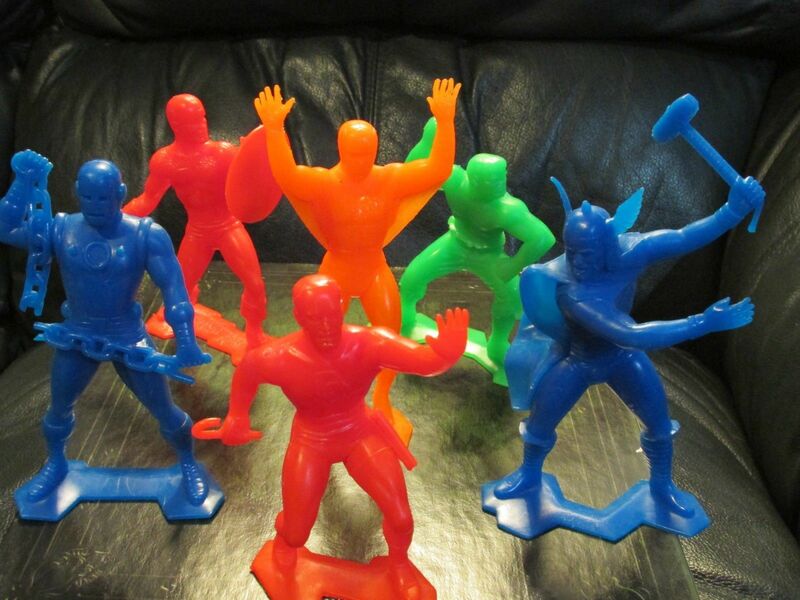 These six first-ever Marvel Comics figures, with no moveable parts/-joints, were licensed and put out by other countries, as well, including Brazil. 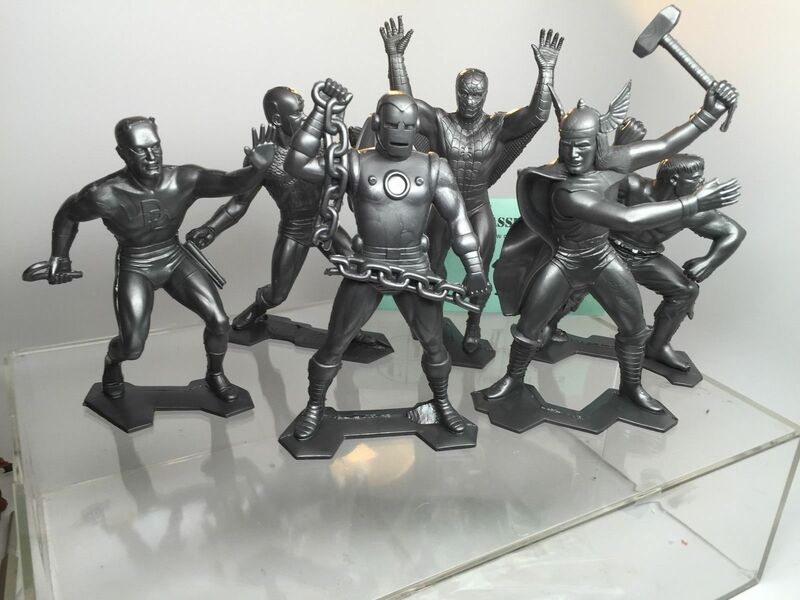 Meantime, Mexico put out some (bootleg, meaning illegally made) examples of these exact same Marx Marvel figures, but these were not licensed! And their quality was poor, comparatively, was poor. 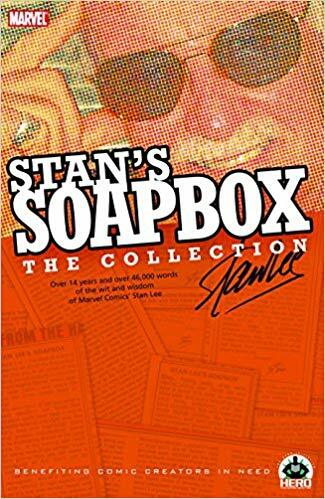 Even as a kid, I’d read ‘Stan’s Soapbox’, which was Stan Lee’s regular column IN each month’s Marvel Comics’ selection of titles. 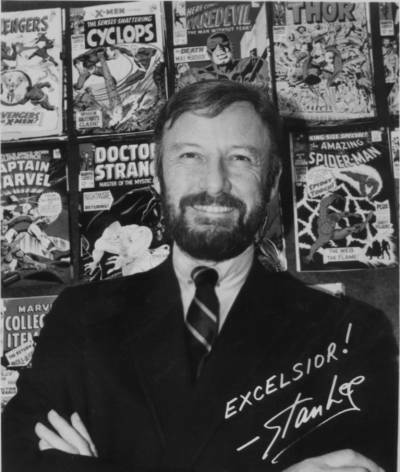 Stan’s Soapbox went on for decades, a column inside each month’s Marvel Comics selections, in which Stan hawked all of Marvel’s products, like the excellent Pitch Man/- ‘Carnival Barker’ that he was, including columns about interviews he had given at universities regarding Marvel Comics, and other Marvel Comics’ licensing deals. For example, the Marvel Comics animated TV character cartoons of the 1960s, which included an individual series of cartoons devoted to solo stars Captain America, The Hulk, Thor, and The Sub-Mariner. All of these were put out by Grantray-Lawrence Animation, in 1966. This company consisted of Grant Simmons, Ray Patterson, and Robert Lawrence. 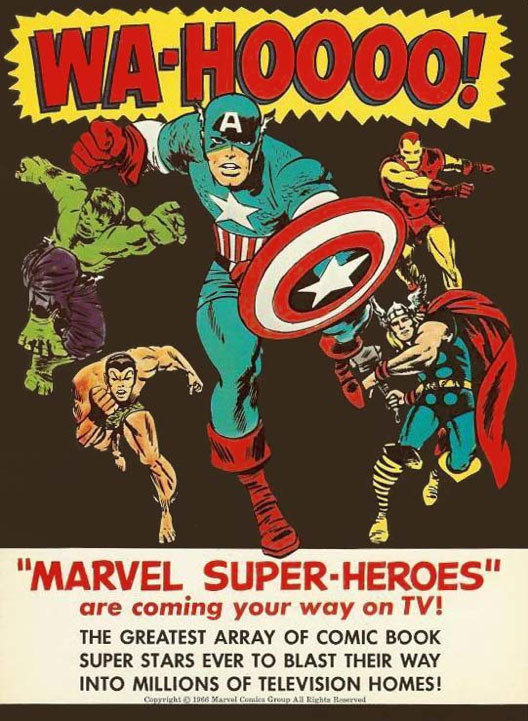 Each Marvel cartoon featured, in each, either Captain America, The Incredible Hulk, The Mighty Thor, Iron Man, or Submariner, and each episode of each hero character toon ran seven minutes long. That’s not a lot of time to develop very detailed plot synopsis! In 1967, the very first Spider-Man animated TV series was produced, where the animation was a lot better, and without any of those still figures in the way of the above OTHER Marvel Comics characters. 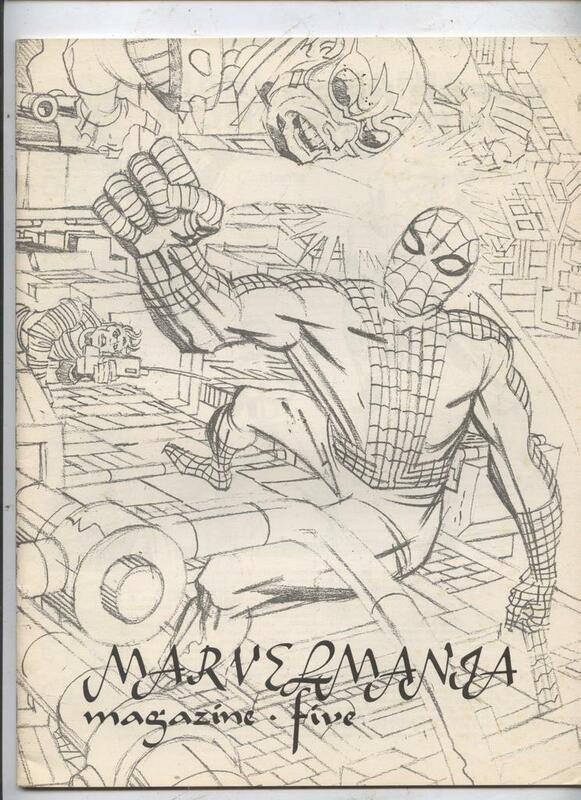 This production wasn’t perfect either, but it was at the same time entertaining; they took some liberties with illustrating Spider-Man’s c costume webbing, in fact, only drawing the full costume webbing on his mask, gloves, and boots. But still, this was, nonetheless a class act, for kids! 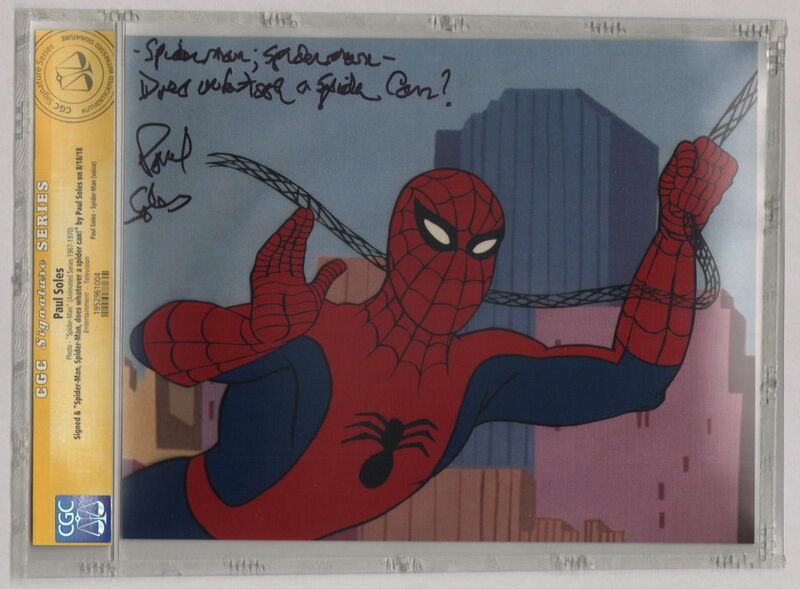 Above: an original Spider-Man animated CEL from the 1967 first animated Spider-Man series, autographed by Canadian Paul Soles, who did the voices for both Peter Parker and (muffled, because of the mask), of Spider-Man’s voice, as well! Hey, it’s on eBay right now, if you want to buy it! And no, I’m not the seller! TAKE 30 ran from 1962 all the way up until 1982, an impressive twenty-year run! The other host of this show, Adrienne Clarkson, later entered Canadian politics, and was eventually elected into the very important Canadian political cabinet post as Canada’s Governor General!! 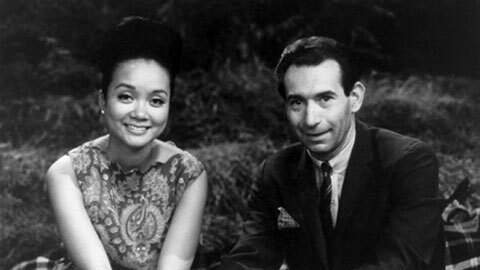 Above: a 1960’s black and white photo of Canada’s Adrienne Clarkson and Paul Soles. Paul Soles was the voice of both Peter Parker and his alter-ego, Spider-Man, in the very first (1967) Spider-Man animated series. 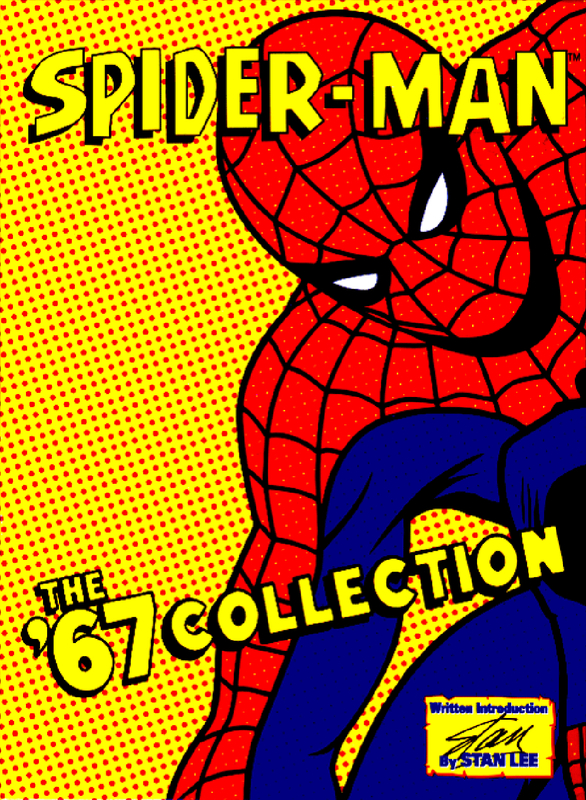 Fortunately, several years ago, the complete 1967 Spider-Man animated TV series came out in a boxed set of DVDs. Which, of course, I purchased immediately! Earlier, I wrote about the 1960’s ‘Stan’s Soapbox’ column in every month’s Marvel Comics offerings, that began in the ’60s and ran in every Marvel comic book for several decades. Decades later, every single ‘Stan’s Soapbox’ Marvel Comics column would be collected and published together, in a ‘Stan’s Soapbox’ book, which I acquired in 2008 when it was published. It’s a very entertaining read, to read all of those Soapbox columns, all together, in one book! Stan Lee took a lot of heat, online and elsewhere, over the years, among Marvel fans, for his not having, (in many of their minds), given co-creator credit(s), of various comic book characters, to the artists, also. Who, in many cases, co-created many of these characters, WITH Stan Lee. Many of whom also helped with the plotting and writing of numerous of these fictional Greek pantheon heroes-like tales. Or, for that matter, of Stan’s not having given many of these artists co-plotter, and co-writing credits, in the comic books themselves. 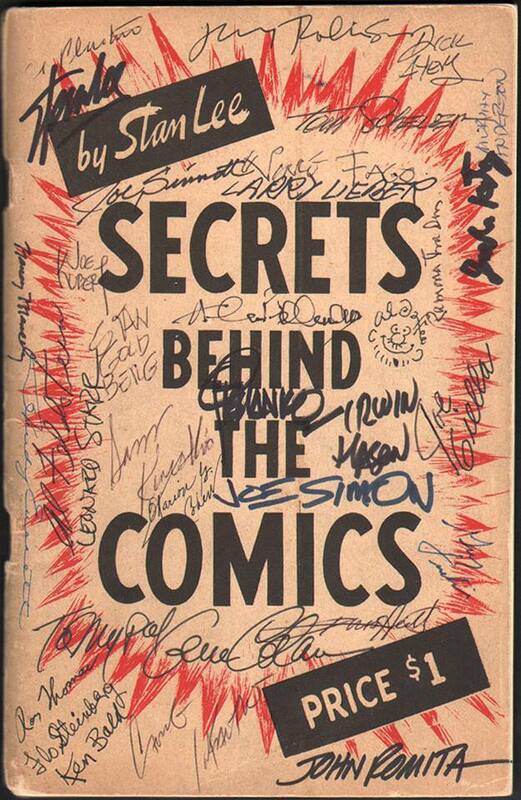 On the other hand, Stan Lee was just about the first comics writer/-creator, to have given written credit, IN the comics themselves, for the various writers of other Marvel Comics hero titles, as well as listed credits in the books themselves, to pencillers, inkers, letterers, and even credits, in print, to the colourists! And so, yes, Stan Lee wasn’t perfect; he had his own ego, not unlike most people. But Stan Lee was also not the devil that a couple of dozen so-called fans of Marvel Comics (some, not all, of which are ‘internet trolls’) — make Stan out to be online, either. Some people just love to bicker, ad infinitum. Which reminds me of a line from the movie, Star Trek Six: The Undiscovered Country. There is a scene in that movie, wherein Captain James T. Kirk went to visit Spock, in his quarters, aboard their starship, the Enterprise. In this particular scene, Spock was lying on his bunk, dressed in his funeral robe, that his body been dressed in, in his photon torpedo tube ‘coffin’, after Spock had been killed, near the end of Star Trek Two: The Wrath of Khan. Spock had miraculously returned to live, of course, in the next film in the series, Star Trek Three: The Search For Spock. 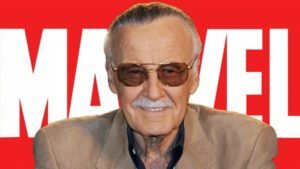 The very day that Stan Lee died, on Monday, November 12th, 2018, and in the days thereafter, the internet Marvel Trolls came out to roost, and to re-battle the ‘non-credit where credit is due’ argument, regarding the artists who did (not) get co-writing credits in those Silver Age Marvel Comics, themselves. Some of their points were very valid, and some, I feel, were not. There exists a legion of Marvel fans out there, who love spending their time online, seeking to demonize Stan Lee, for many of the (sometimes, but not always imagined) above ‘offenses’, or reasons. Many (not all) of them, I place in the same Camp as the internet trolls who frequently argue online, as to WHO was more important to the history of the Silver Age (the 1960’s) Marvel Comics, Jack Kirby, or Steve Ditko. These insipid and adolescent arguments have no basis in reality. They never ever did. And what is more, they never will. This particular argument is infantile. Both of those creators were extremely important to many Silver Age Marvel Comics characters. Whenever I see these types of arguments online, they remind me a lot of childlike statements of this caliber: “Hey, if The Hulk fought Thor, who would win?” It makes me tempted to say, “Hey, move out of your mother’s basement, and get a job! When Jack Kirby, in the 1970s, quit Marvel Comics, and went to DC, to create The New Gods, Mister Miracle, and The Forever People, (to name some), a fair amount of his reason for doing so, was that many people had poisoned his mind about Stan Lee, with the above vitriol about his not having been given proper Marvel characters’ co-creator status. Previously, Jack Kirby was happy and content to be creating comics for Marvel, prior to that. But don’t get me wrong. I’d never want Kirby’s The New Gods, Mister Miracle, and The Forever People, etc., never to have existed. Perish forbid! By the way, it’s a well-known fact that Jack Kirby created The Silver Surfer on his own, inserting the character into a Silver Age Fantastic Four issue. And of course, Joe Simon and Jack Kirby co-created Captain America in the early 1940s. Whereas, Stan Lee’s first ever published comic bookware was a text/-prose feature story, in Captain America Comics # 4, from 1941. 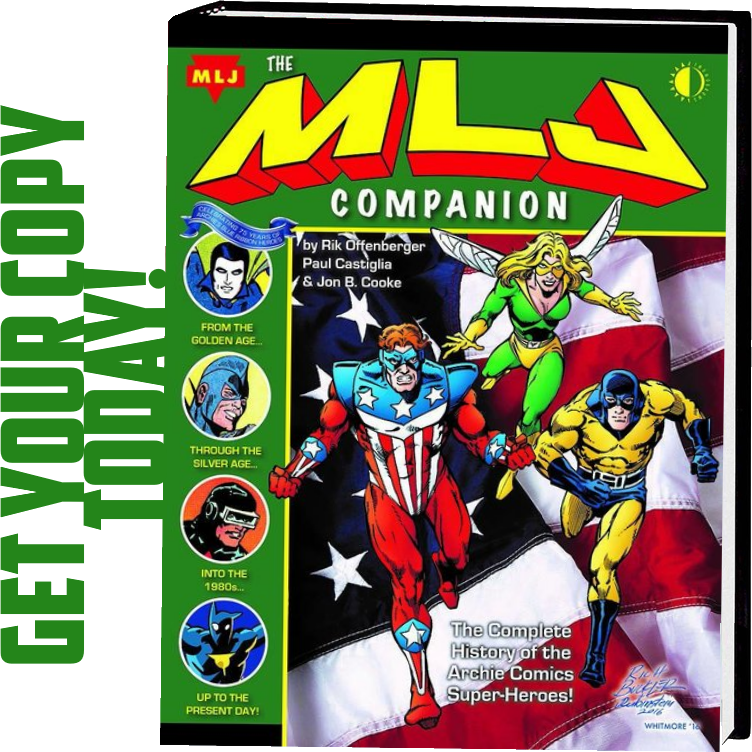 MLJ’s The Shield patriotic superhero preceded Timely’s (later Marvel’s) Captain America, however. The particular attached photo scan of the cover of this 1947 book, however, isn’t my copy, however. It is, rather, the copy proudly owned (and with good reason), by Dr. Michael Vassallo, who, in comics fandom, is more often referred to as ‘Doc V.’ (He’s a dentist.) As well as being a published author! Gee, given a choice, I’d much rather have HIS copy! 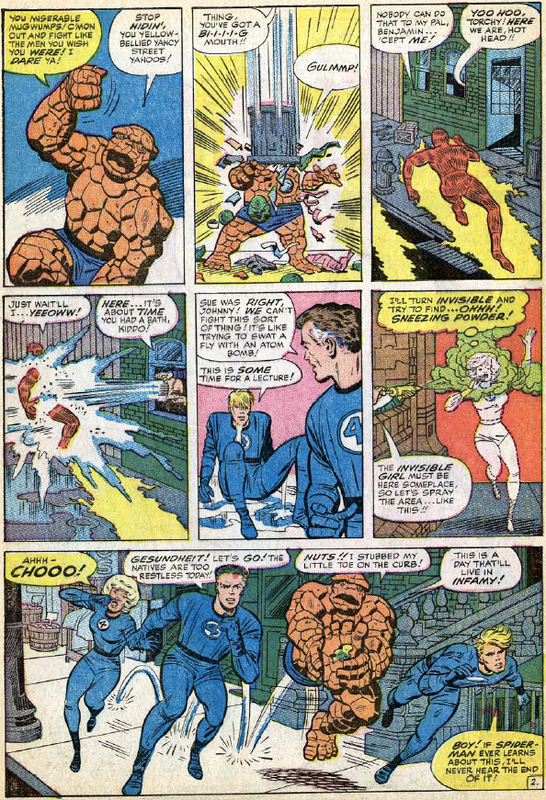 In the Silver Age of Comics, in Fantastic Four comics, there was a group of teenagers who were always poking fun of Benjamin Grimm, better known in The Fantastic Four, as The Thing! These troublesome ‘Yancy Street Gang’ teenagers, in New York City, lived over on the fictional Yancy Street, of course. They were known as The Yancy Street Gang. You’d often see just an arm or a hand throwing a rock, or some such, at the hapless Ben Grimm, yelling a pejorative expletive his way, for example, “Hey, get outta town, ya bum! !” or some such. 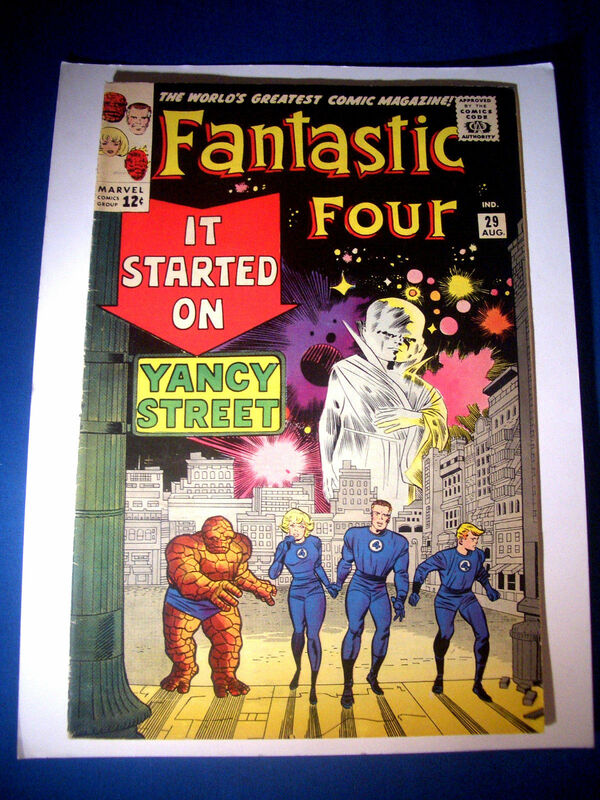 So much for The Fantastic Four’s ‘The Yancy Street Gang’. 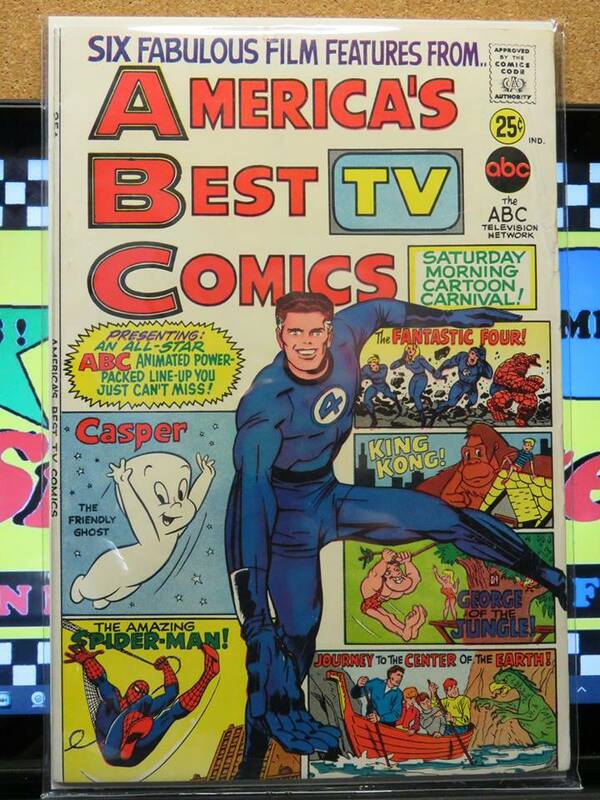 Then, there is Mr. Allen Bellman’s book about Marvel Comics, edited by Michael J. Vassallo and Audrey Parente. Allen Bellman was an artist of Marvel Comics in the Golden Age (the 1940’s) of Comics at Marvel — which, at the time, was called Timely Comics; and still later, Atlas, before this same company eventually became Marvel Comics. Michael J. Vassallo, Barry Pearl, and Nicholas Caputo all co-ordinated their writing effects, in putting together the massively entertaining volume, ‘Seventy-Five Years of Marvel.’ This impressive (and extremely heavy), fact-filled volume is a masterpiece of writing and graphics; based on its’ sheer size and weight, however, if you ever fall in to a deep river, carrying this monster, rest assured, effendi, that you are going right to the very bottom of Davie Jones’ locker! From left to right, below: Nicholas Caputo, Barry Pearl, and Michael J. Vassallo. The replacement, so to speak, of Marvel’s ‘The M.M.M.S’ (Marvel Merry Marching Society), didn’t come till quite sometime after The M.M.M.S’ had run its’ course. In between The M.M.M.S. was Marvelmania, which lasted but a single year! The M.M.M.S. 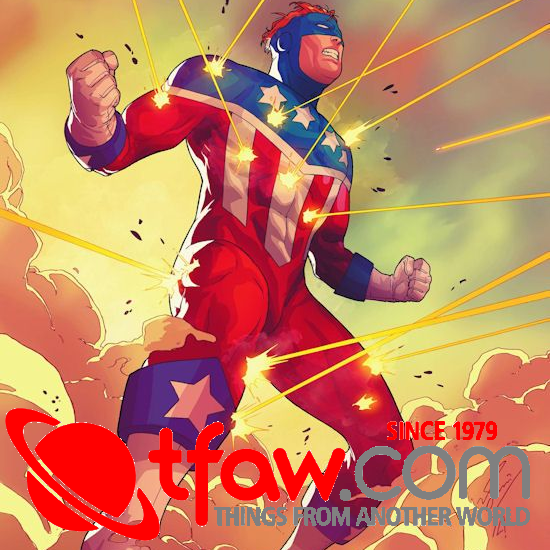 history had been from 1964 to 1969, while FOOM, spelled without periods (‘Friends of Ol’ Marvel’), materialized as a result of Marvel artist Jim Steranko having dropped by the Marvel offices. 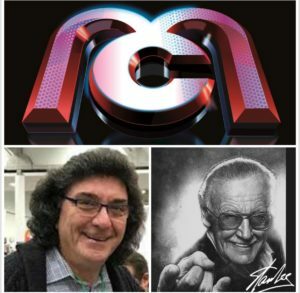 Stan Lee informed Steranko that he was planning to start still another Marvel fan club. 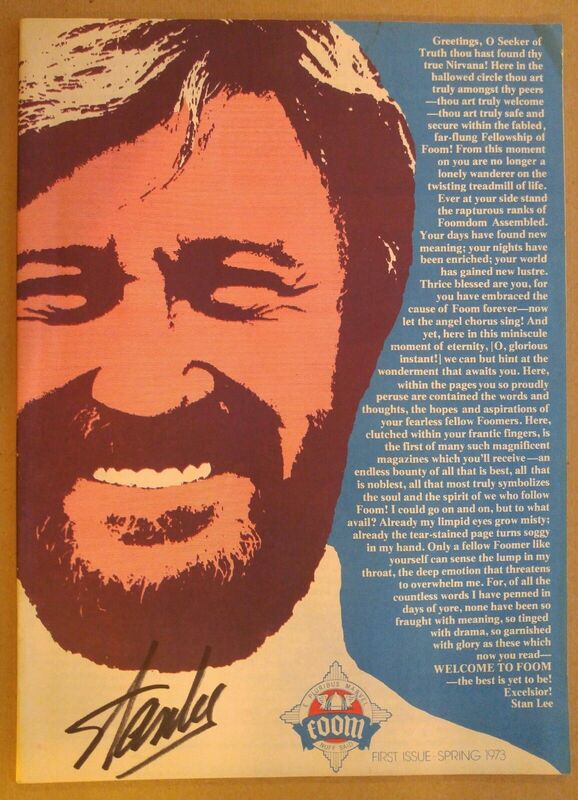 Steranko informed Stan that he himself had some ideas for it; and he, in fact, said as much, in the first issue of FOOM introduction piece. Jim Steranko’s services toward the mag were volunteered. He had said that he well recalled the days of radio drama plays, like The Shadow, etc., and all the free clubs and premium offerings based on popular Pulps, comics and radio characters, like rings, and so on. 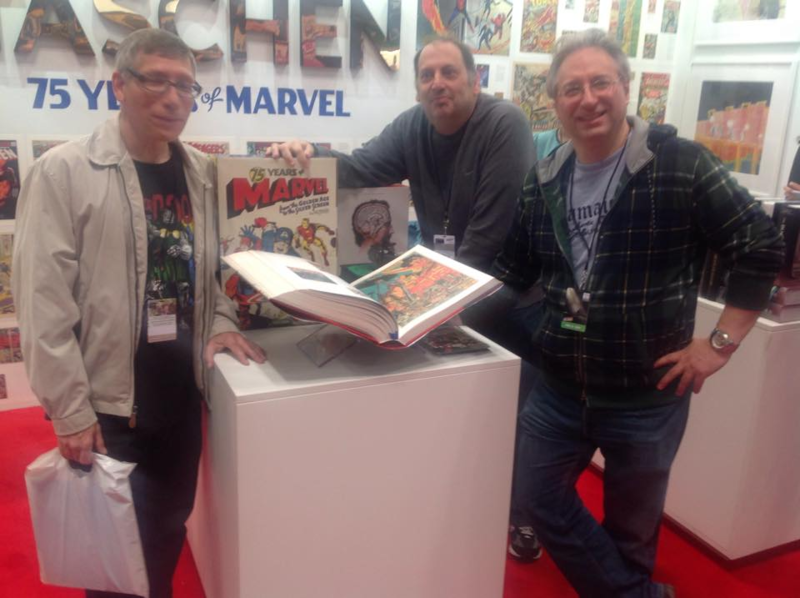 Ken Bruzenak was an Associate Editor of Foom, while Marvel editor-in-chief ‘Rascally’ Roy Thomas was the consulting Editor. Ed Noonchestor, Gary Brown, and Joel Thingvall served as additional staff. In order to subscribe to FOOM, one had only to mail in three dollars U.S. Canadian subscriptions cost a dollar more. By sending in an extra dollar, one received an I.D. card, six Marvel decals, and a poster. The other items (besides the poster, that is), have since disappeared, over the decades since, from my collection. However, I still have the two issues of FOOM that I received. The FOOM membership kit (which I did not send for, as I couldn’t afford it, as a teen, cost an additional $2.50 U.S. 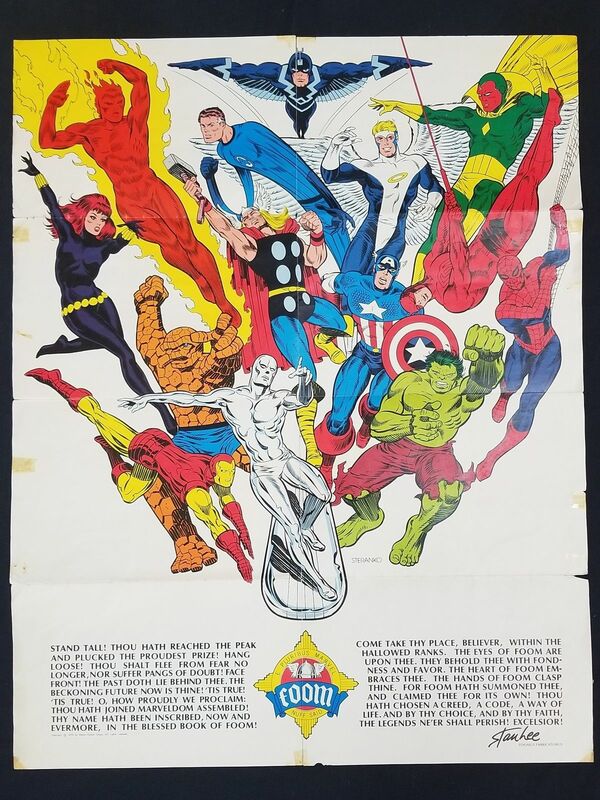 The FOOM poster consisted of several Marvel Comics characters, illustrated (in full colour), by Jim Steranko, himself. Here’s a photo scan of this mid-1970’s Marvel STERANKO poster, below …. And, you’ll recall that I mentioned that I (only) received two issues of FOOM, as a result of this subscription. I received a single issue, # 17, the cover of which bore Stan Lee’s smiling face, with various Marvel Comics characters costume hints, in attendance, ‘pon his face. After several hand-written (and very polite) Canada Post mailed letters to Marvel, to remind them that, hey, I subscribed, I eventually, months later, received a second FOOM issue, # 19. Issue nineteen, not eighteen, do note. This second issue I received featured a Defenders cover. That was the last issue of FOOM I ever received, despite more polite letters to Marvel, that I would ever receive. I’ve always admired Jim Steranko’s Marvel (and other) comics art, and comic books, despite the fact that his career in comics, was a brief flash in the pan. But it was, nonetheless, undeniable, that his artwork in comics, as well as the covers of numerous reprinted THE SHADOW pulp magazines, in paperback book form, and some other things, including his seminal work, CHANDLER, sort of set the comics fan world on fire! And his two books on the history of comics, those set a new high bar for books of the same, to follow. So I admire Jim Steranko the artist. The photo scan below is a photo that I found online, of the 1960s and 1970’s Marvel, DC and other Halloween masks. Top row, left to right: Spider-Man, Iron Man (back when, in the comics, his armoured mask had a beak! ); Captain America, Thor (he forgot his name, so he scribed it on his helmet), and The Hulk, complete with lipstick! Second row: The Swamp Thing, Superman, Hawkman, Green Lantern, and Conde Nast’s The Shadow! The guy who created Spider-Man and the Hulk has died, and America is in mourning. Deep, deep mourning for a man who inspired millions to, I don’t know, watch a movie, I guess. Someone on Reddit posted, “I’m so incredibly grateful I lived in a world that included Stan Lee.” Personally, I’m grateful I lived in a world that included oxygen and trees, but to each his own. 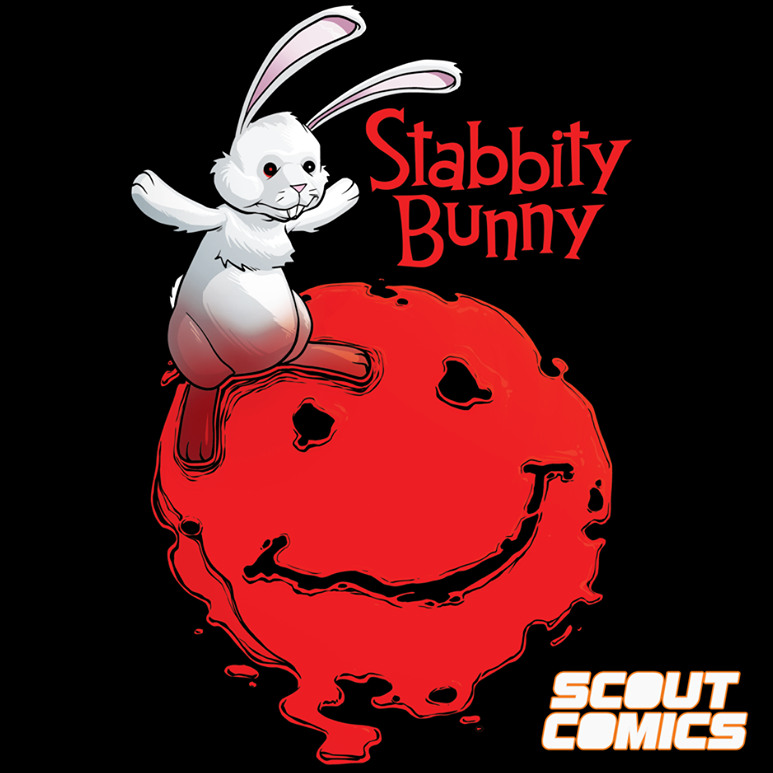 Now, I have nothing against comic books – I read them now and then when I was a kid and I was all out of Hardy Boys. But the assumption everyone had back then, both the adults and the kids, was that comics were for kids, and when you grew up you moved on to big-boy books without the pictures. But then twenty years or so ago, something happened – adults decided they didn’t have to give up kid stuff. And so they pretended comic books were actually sophisticated literature. And because America has over 4,500 colleges – which means we need more professors than we have smart people – some dumb people got to be professors by writing theses with titles like Otherness and Heterodoxy in the Silver Surfer. And now when adults are forced to do grown-up things like buy auto insurance, they call it “adulting,” and act like it’s some giant struggle. I’m not saying we’ve necessarily gotten stupider. The average Joe is smarter in a lot of ways that he was in, say, the 1940s when a big night out was a Three Stooges short and a Carmen Miranda musical. The problem is, we’re using our smarts on stupid stuff. I don’t think it’s a huge stretch to suggest that Donald Trump could only get elected in a country that thinks comic books are important. Yes, in my own opinion, I think that Bill Maher was way off the mark this time. There is nothing wrong with American popular culture, which includes jazz (which I love), and The Arts, which — sorry, Bill Maher, DOES include comic books and comic newspaper strips. They are an important part of our entertainment culture. I watch the news daily, both American, Canadian, and World News. There is a lot in the news, that is unsavory and yes, downright depressing, (if) you let it get to you. I think it is important to keep up on current events, the good as well as the way, to basically just know what the hell is going on with the world. Based on the shape that the world is in these days, especially a world which currently has the planet’s most powerful and important nation run by a racist/misogynist/pathological liar/supreme egotist, (and very likely seriously mentally ill, to boot), to name JUST SOME of this megalomaniac’s problems and issues affecting the entire free world — this alone could be one of the important reasons that comic books (as escapist entertainment, and the movies based on them), are STILL about as entertaining and as important as ever, to fans who need escapism, at times, from present-day reality! On the other hand, is Bill Maher ENTITLED to his low opinion of Stan Lee and comic books, in general? In a democracy, yes, folks, he absolutely is! Free speech is supposed to be one of the most important tenets of what democracy (among other things) is based on, to begin with! And so, will I cease to listen to Bill Maher TV monologues, because of what he said about the late Stan Lee, and about comics, in general? The answer is, absolutely not. Because I am an adult, and Bill Maher is frequently right on the mark about so many other things. I simply don’t agree with him, on this one. Stan Lee, a.k.a. The Amazing Persona-Man-! 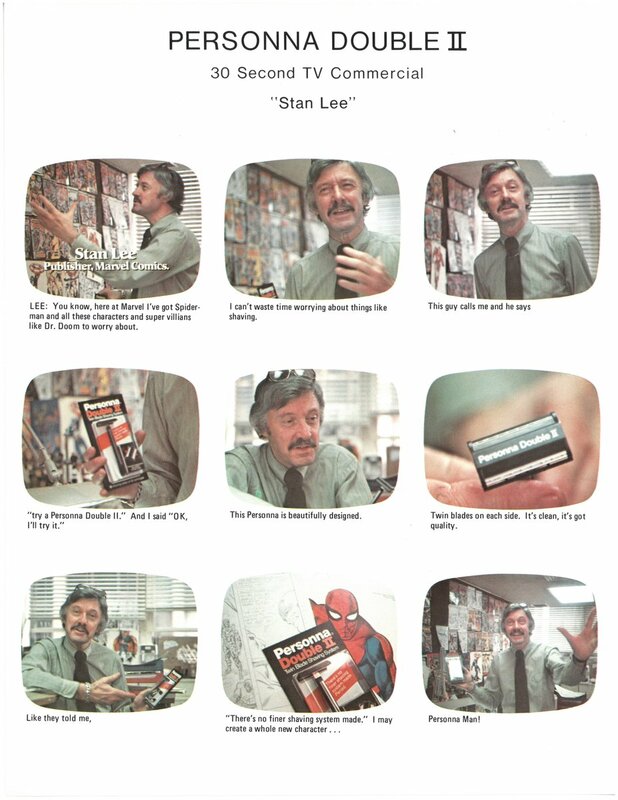 In 1976, Marvel Comics legend Stan Lee taped a TVcommercial for Personna razors to promote their Personna Double II. In the 40+ years since no actual footage of it has been seen. 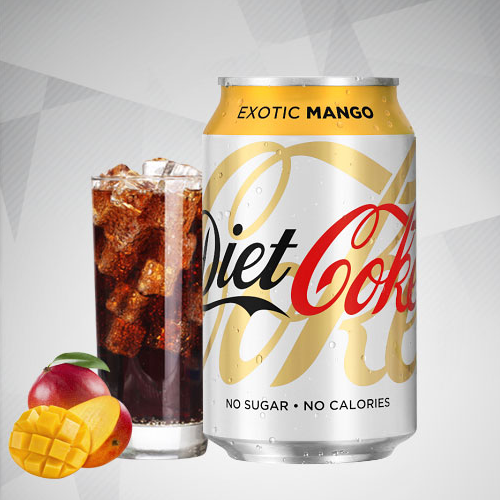 However, a print version of the ad has been found online along with a Soapbox page where Stan discusses the commercial. Apparently, the3re is no video of this Stan Lee Personna Razors commercial on the internet. More’s the pity. But here are some stills from it, below! the late Peter Gzowski. Well, Stan The Man himself ALSO appeared on a different episode of the same Canuck TV series, talk show NINETY MINUTES LIVE, in 1977! Remembering that I had seen BOTH the Human Fly episode, as well as the Stan Lee episode, of NINETY MINUTES, LIVE, as a teenager, I went looking for both episodes, on YOUTUBE, online, several weeks ago. And, I found them both. Here, below, is a link to the Stan Lee episode of NINETY MINUTES LIVE, from 1977! (a) At the beginning of the episode, after Peter Gzowski announced who his next guest was, Stan Lee came swinging on to the stage ON A ROPE, ala Spider-Man! Peter Gzowski pretended to be surprised! To which Stan Lee quipped, “Well, you can never get a cab, in this city!” ~ or words to that effect! The second segment missing from this ‘YOUTUBE’ Stan Lee segment, is that, at one point, Peter Gzowski verbally ‘cornered’ Stan Lee, and pointedly asking him for the scientific reason as to how The Mighty Thor, a former ancient history Norse God, has, at Marvel, learned to fly! Well, if Peter Gzowski was trying to STUMP poor ol’ Smilin’ Stan, it’s probably well that he never held his breath, because Stan had the perfect answer, which he began to extrapolate/-explain to Gzowski, at great length! The following is, of course, a paraphrase, from what I remember of it. “Y’see”, s Stan began, “Thor, at Marvel, is among the pantheon of the most super-powerful, most incredibly super-strong cats AT Marvel. His strength and power is in The Hulk’s, and, — dare I say it — Superman’s class level! Or words to that effect. The audience cracked up! Stan Lee, born Stanley Martin Lieber, and brother to also comics pro Larry Lieber (now retired), is no longer with us. Stan Lee, December 28, 1922 – November 12, 2018, is now with The Angels. Phil Latter is a Canadian Comic Book Historian, and is the First Comics News Canadian Bureau Chief. He has collected, read & enjoyed comic books, collecting prolifically, his entire life. He collects comic books, vintage Pulp magazines, original comic book art, vinyl record albums, (including Power Records, and Zorro items. He's collected vintage comic books & new comics, for over 40 years. He says, "Comics keep me young at heart!" Phil's personal comics collection features over 85,000 comic books, (not a typo), mostly U.S. and Canadian comics. But, further, comic books & related memorandum from all over the world, dating from the early 1920's, right up to the present. Phil Latter is recognized as being one of the foremost world authorities on Johnston McCulley's Zorro. He is an artist & published writer, and he collects anything and everything to do with the Zorro character. His well-known Pulp magazine website for this character is at Yahoo Groups: https://groups.yahoo.com/neo/groups/johnstonmcculleyzorro/info To join us on this popular group, membership at this busy website, is free! Phil has been published in Roy Thomas' 'Alter Ego' magazine, and (in prose fiction, reviews, articles, & his artwork), in numerous issues of the Canadian English language (from Quebec) Batman fanzine, 'The Midnight Conference.' 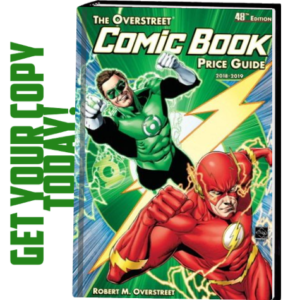 Additionally, he has conducted numerous interviews of comics pros, columns and articles, on the websites, Silver Bullet Comic Books.com, Comic Bulletin.com, and at First Comics News.com. And also in these additional fanzines: 'The Maine Comics Club Newsletter', & in numerous issues of both 'The Dragon Lady Dispatch' (from Toronto's 'Dragon Lady Comics Shop'), and in many issues of the fanzine, Gene Kehoe's "It's A Fanzine." Born in the village of Herring Cove, right on the Atlantic Ocean, Phil currently lives in The Halifax Regional Municipality, in the Canadian province of Nova Scotia, with his four felines: Jasper, Ivy, Oscar, and...Zorro-!